New Zealand’s most popular white racehorse The Opera House has produced yet another white foal at Windsor Park Stud in Cambridge. The daughter of Zabeel and the Star Way mare Carmina Burana foaled a filly by 2015 Caulfield Cup winner Mongolian Khan at the stud in Cambridge in the early hours of Tuesday morning. 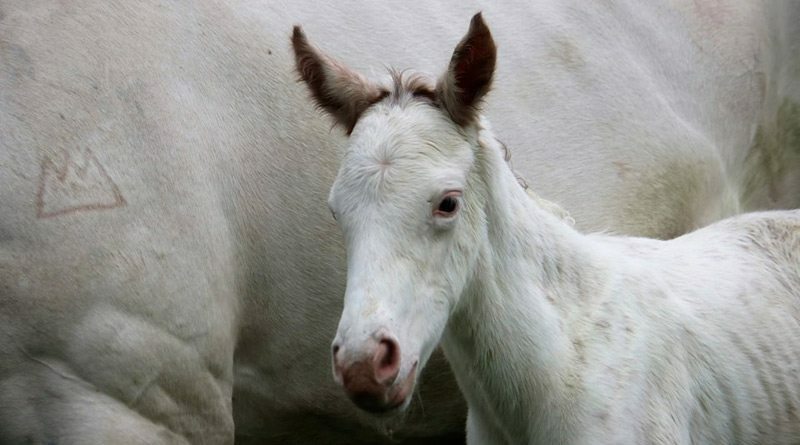 The youngster is The Opera House’s fourth white foal born in New Zealand, following two foals born in Australia of plain colouring. The Opera House was born at Cambridge Stud in 2006, and was the first white thoroughbred filly sold at auction in Australia when she was bought by John Singleton for $A280,000 as yearling in 2008. She was bought by Windsor Park Stud after being offered at the Magic Millions Gold Coast sales in 2013. She had two foals in Australia. Her 2014 daughter by High Chapparal sold to Japan in 2016 for $450,000. She is now named Casta Diva, and won her first race in June. Her 2015 colt by Shamexpress was also white, and was bought for $510,000 at Karaka earlier this year by the China Horse Club and Australian Ciaron Maher. The Opera House’s 2016 filly, also white, is by Charm Spirit and has not been named. Her two plain coloured foals in Australia included a 2012 bay filly named Harbour Bridge, by 2008 Kentucky Derby and Preakness Stakes winner Big Brown. Well done! Beautiful Mom and baby. Have a happy life.